PLEASE, PARDON THE DUST BUT WE ARE REBUILDING THIS PAGE. SORRY FOR THE INCONVENIENCE. • A special 3D screenings of Lakai Skateboard’s “Unbeleafable”, Krooked Skateboard’s “Krooked 3D DVD”, and Red Bull’s “Canvas Skate 3D”; followed by Q & A with filmmakers Ty Evans, Colin Kennedy and Erik Bragg at the Downtown Independent Theater. 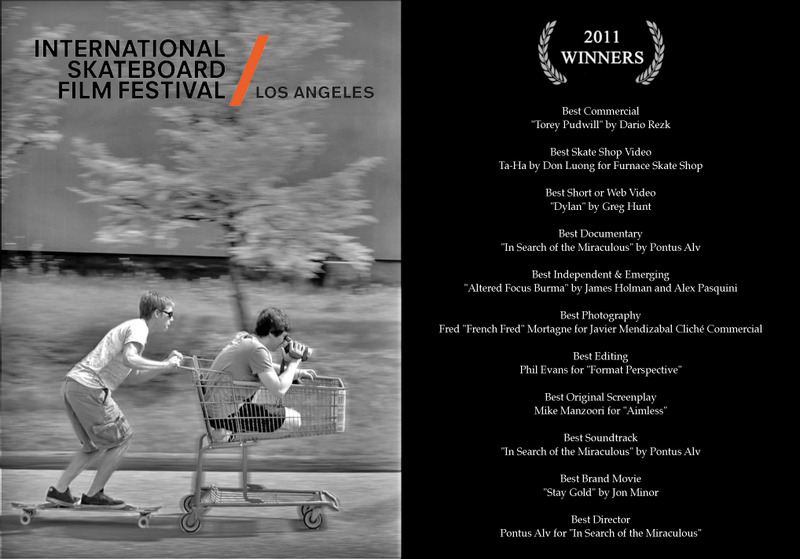 • An exclusive sneak peek at the “Bones Brigade Documentary” by award-winning skateboard film director Stacy Peralta. • A teaser preview of “Waiting for Lightning”, a documentary on the life of professional skateboarder Danny Way, directed by Jacob Rosenberg. Stacy Peralta was honored by the Academy of Skateboard Filmmakers Arts & Science for his influence on skateboard filmmaking and the industry at large. “There’s a huge difference between seeing a movie on your TV or computer screen and seeing it on a big screen in a movie theater”, said Academy member and director Greg Hunt, after spending a few hours at the Downtown Independent Theater watching the top nominated films at last year’s Festival. Hunt couldn’t have put it better, because it doesn’t matter how good a movie is, it doesn’t reach its full potential until you see it on the biggest screen possible. The films that the Academy will nominate this year deserve to reach that potential. 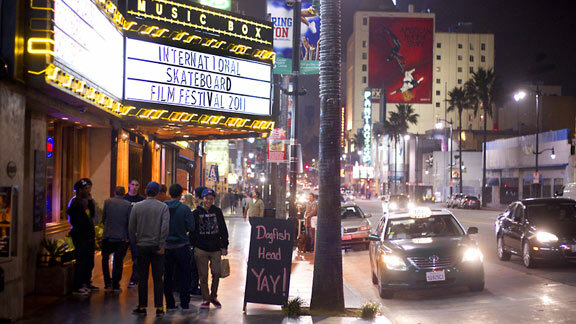 The ISFF committee and our partners selected two screening venues for the 2011 International Skateboard Film Festival: Downtown Independent Theater for Los Angeles and Long Beach Art Theater for err.. Long Beach. By adding the Long Beach Art Theater as a venue, the Festival will be able to reach a “south of L.A.” audience that wants to see the movies on a big screen while avoiding the traffic difficulties.